'Trousers, Flying, Winter, Type A-3'. By Perry Sportswear, size 40 Regular. 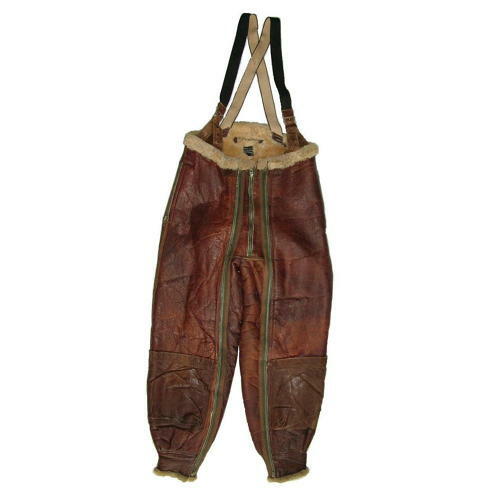 The A-3 trousers along with the B-3 jacket formed the first shearling flying outfit used by the Army Air Corps in 1934 and were issued until March 1944. The shearling trousers were finished with a polyacrylate dye and lacquer and featured full length zips, a fly zip and open patch pockets below the knee. In addition there were zipped side seam pockets at the waist and adjustable braces to help aleviate the weight. This pair is in good '+' condition with undamaged supple leather. There is minor surface wear at the back of the left leg and surface crazing/thinning, largely around the upper left backside. This area does feel quite fragile/papery and although there is no damage care is advised - see photographs 12&13. The fleece is in lovely condition and they are complete with original chain hanger, label and braces. All zips are original 'Talon' brand. They have light verdigris marks but are mostly in good working condition. Note that one of the main zips has some missing teeth so should not be fully opened. Most USAAF shearling has aged badly and displays cracking, rotting, tearing, crazing and peeling. These are nothing like that and whilst we don't recommend you wear them, they would make a superb mannequin display. One of the better pairs we have had. Stock code S22271.